Leitrim remains unspoilt, a haven from the stresses and strains of modern urban living. A holiday in the midst of Leitrim’s charming rustic scenery is a recipe for relaxation and renewal. 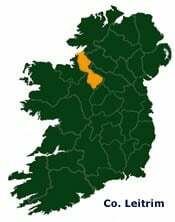 With just two miles of coastline, Leitrim is a mainly inland county of rolling hills, lakes, rivers, pastures and boglands. River cruising is amongst the many popular activities in the area. Carrick-on-Shannon is one of the best developed centers on the River Shannon for hiring cruising boats. In addition, the Shannon-Erne Waterway which links both rivers, weaves together the streams, rives and lakes which are widely scattered between Leitrim village and the River Erne. The pastimes are numerous. You can go horseriding, explore one of the many beautiful lakes or the River Shannon by boat, sail dinghies, play golf at one of the well-kept uncrowded courses and the fishing is great for both the expert and the novice. Wherever you are in Leitrim, you are sure to be made welcome and perhaps even join in the music, song and dance, so characteristic of the area.